In this article, Mark James, Partner – Dispute Resolution, Coffin Mew, explores the opportunities for the construction industry arising from the Government’s education agenda. From renovations and refurbishments to the building of new and interactive learning environments, what is happening and how can construction play a positive part in improving educational standards? After a few years of steady growth for construction output in the education sector from 2013 to 2016 that reached a peak of around £11.2Bn in 2016, activity seems to be declining slightly on the path to 2021. With an ever-increasing demand for school places and pupil populations across the country expanding to capacity and beyond, the Department for Education has a difficult balance to strike between opening new schools and improving the condition of the existing school estate, particularly in the context of severe financial constraints. As we welcome September and the new school term, now seems as good a time as any to take stock of the current landscape for the construction industry on the back of the government’s education agenda. It is the responsibility of each local authority to ensure there are enough places for all children to attend good schools within its area. The Department for Education’s role is to allocate capital funding to enable local authorities to manage the supply and demand of school places. To relieve the pressure on local authorities caused by the rapidly growing school-age population, the government’s 2015 Spending Review announced a £23Bn capital investment to facilitate the opening of 500 Free Schools, and provision of over 600,000 additional school places. Free Schools are independent, state-funded schools that have been brought in to increase choice for parents, encourage innovation and stir up competition to improve education standards. The Free School expansion plan was bolstered by a further contribution of £320M in the 2017 Spending Budget. 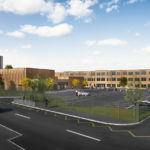 Construction projects in England’s education sector are also being driven by the government’s Priority School Building Programme (PSBP), which recognised the need to maintain existing schools with a £4.4Bn investment to rebuild and refurbish schools in the worst condition across the country. The programme is being rolled out over two phases and will cover a total of 537 schools before coming to a conclusion in 2021. However, some say the Department for Education’s initiatives have not gone far enough. A report by the Royal Institute of British Architects (RIBA) titled ‘Building a Better Britain” comments that schools built under the PSBP are “just too cheap” and suggests that an additional 20% capital investment is required to achieve quality schools with good durability to limit future repair and maintenance costs. The RIBA observes that the government is failing to properly analyse how well school buildings are performing against their design objectives and recommends that a focus on better design can help ensure that government funding for schools stretches as far as possible by delivering better value for money. Controversy surrounding the government school building programmes triggered two high-profile public enquiries into Capital Funding for Schools last year, one by the National Audit Office (NAO) and another by the House of Commons. Among other things, the reports concluded that capital funding is perhaps not being applied in the most coherent and cost-effective way. The reports also recognised that the Department of Education is not yet able to reliably assess the state of the existing school estate and how the condition is changing over time, which means funding may not be targeted according to the greatest need. A significant part of the school estate is in poor condition and in need of urgent overhaul. The NAO report suggests it would cost an estimated £6.7M to return schools to satisfactory or better condition and forecasts that this figure will double by 2020-21. Given that a further 420,000 new school places are needed by 2021 to meet the growing demand, the tension between opening new schools and maintaining existing schools will continue to mount. With the Free Schools initiative and the PSBP tarnished by evidence that capital funding is not being utilised efficiently or targeted appropriately, the extent to which the Department for Education will adjust their approach is yet to be seen. While higher education construction work represents a smaller market than the schools and colleges sector, university development projects seem to be on the rise. This is so despite a significant decline in UK university applications, which were down 11,000 from last year according to the Universities and Colleges Admissions Service (UCAS), with the decline largely explained by there being a lower population of 18-year olds available to go to university. Construction output in the higher education sector is forecast to rise to around £4Bn by 2021 as universities seek to invest in research, teaching and accommodation facilities to compete for higher fee-paying students. The shortfall in university owned halls of residence continues to be met by privately funded purpose-built student accommodation (PBSA), a sector which has seen significant growth over the past few years. The Department for Education’s problems do not stop there. It has been reported this month that thousands of children with special educational needs and disabilities (SEND) are not getting the essential support they need following cuts to funding. The consequences of these cutbacks include a reduction in the number of specialist teachers and teaching assistants, and pupils with SEND struggling to access vital services, support, specialist equipment and teaching materials. As a result of this, many schools can no longer afford to support children with SEND, with some schools excluding disabled children or encouraging parents to remove them. Figures show that the number of children with SEND left without a school place more than doubled from 2016 to 2017, with the total number reaching over 4,000 last year. In addition, pupils with SEND are up to six times more likely to be excluded and make up almost half of all permanent exclusions. In response, the campaign group SEND Family Action has launched a crowdfunding appeal towards a legal challenge against the Secretary of State for Education, Damian Hinds. The action is being led by a group of parents of children with SEND who have seen firsthand the catastrophic impact the cuts are having on disabled children and the wider school age population. The group claim that government policies are leaving local authorities with insufficient money to fulfil their statutory responsibilities to disabled children and this is undermining their legal right to an inclusive education. This national action follows a number of judicial review challenges against local authorities in respect of SEND funding. In August 2018, a court ruled that Bristol City Council acted illegally by cutting £5M from its SEND budget, forcing the Council to back down on the cuts. The High Court has granted permission to a further two challenges against funding plans of Hackney Council and Surrey County Council which will undergo judicial review later this year.